The West Central Connection Chorus is a men’s a cappella chorus located in Willmar, Minnesota and serves the west central part of the state. 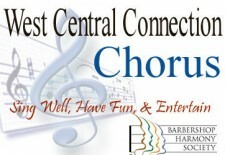 The West Central Connection Chorus is a member of the Barbershop Harmony Society. We rehearse at the Willmar Community Center on Monday evenings at 7:00pm. Our director is Todd Mattson and we invite any men interested in singing to join us. The West Central Connection Chorus brings men together in harmony and fellowship to enrich lives through singing and performing. To be the premiere men’s a cappella group in West Central Minnesota that area men want to join.